Kit includes: 1” Carbide tipped spur bit for boring edge-bore holes, a 2-1/8” Carbide spur bit for boring the cross-bore hole and an 1-1/2” Carbide Tipped spur bit is included for boring dead bolt holes. Also included are two mortise markers, 1” x 2-1/4” to mark the outline of the latch plate on the door and a 2-1/4” x 'Full Lip' strike plate on the jamb for mortising with your chisel. To complete the kit we include a 1/2” heavy duty hex drive quick-release drill adapter to chuck the bits into your drill motor, an 1-1/2” reducer ring to use with the 1-1/2” spur bit and an aluminum latch bore strike center marker with a stainless steel point. 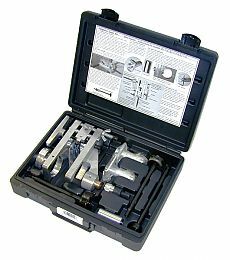 This complete kit is enclosed in a rugged black plastic case with strong latches.